If your career is hitting the point where a serious contract is on the table, please read this (and get a good lawyer), whose seen their fair share of artist contracts over the decades – major, indie, good, bad, or otherwise. First, let me give every artist and manager a quick primer on what a 360 degree deal is. Basically, the 360 is an exclusive recording contract between a record company and an artist in which, in addition to monies from sales of the artist’s recorded music, the label shares in other income streams such as touring and live performance, merchandise, endorsements, appearances in movies and TV, and if the artist also writes songs, publishing. In fact, most 360 deals have catch-all phases giving the label a financial interest in everything else that the artist does in the entertainment business. A traditional recording agreement only provides an income stream for the label from record sales. But similar to the traditional recording agreement, under the 360 deal the label acquires the copyrights in the artist’s recordings and options for multiple albums. The 360 deal also usually includes all the same deductions from record royalties as the traditional deal, including producer royalties and reductions for packaging, “net sales,” foreign sales, midprice and budget records, and even “new technology.” (originally applied to CD royalties and now to digital sales). The 360 deal is not new. The first reported one was EMI in 2002. But in the last few years 360 deals have become common place. New artists signing with a major label or their affiliates can expect it as a matter of course. 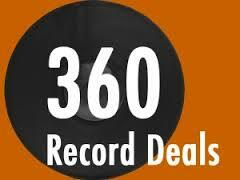 The reason for the prevalence of the 360 deal is the dramatic decline in income from sales of recorded music. Income from sales of pre-recorded music reached its peak in 1999. By 2012 the amount had decline of more than 50% not accounting for inflation. Under the traditional paradigm, the label would pay the artist a small royalty which was even smaller after all the deductions. The artist could expect to receive no recording royalty at all unless his album was a major commercial success. But he got to keep everything else: publishing, merch, touring, endorsements, etc. This is the reason that labels began to pursue income from sources that would have once been sacrosanct to the artist.